My students recently urged me to give 'aa' a try. No, I am not an alcoholic! 'Aa' is the name of a 'test your reflexes' game. Look at the image. The big wheel is turning, sometimes at a constant rate, sometimes at a variable rate. When there is room, you must shoot the next number so that it does not crash into a spoke. The Good: 'aa' is fast, fun and very addictive. The Bad: The game doesn't vary much. Sometimes the wheel will spin clockwise, sometimes counter clockwise. That's basically it. The Ugly: multiple times, I was very patient, waiting for the wheel to spin and shoot into a gap.....when suddenly, the program thinks that there's been a collision. This has happened maybe 10 times to me so far. The miscellaneous: I was stuck on level 26 for at least an hour. 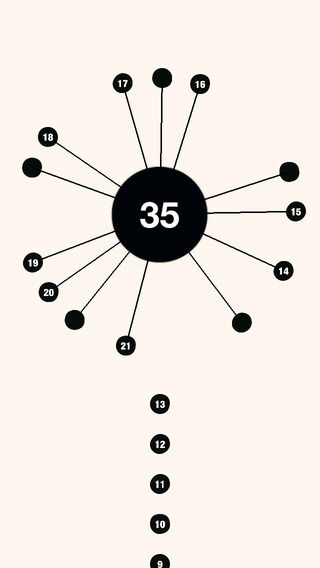 Now I'm stuck on level 49 and I don't think I'll get past it. Would you believe that there are 525 'entirely unique' levels? Once you've done 48 levels, that's enough. If you want to play a genuine variation, look for their other apps: ff, au, rr and uu. Great site Tom. Keep up the good work, are you focusing just on Ipohone apps, now instead of traditional puzzles? I've been on level 80 for about three days playing maybe 3 hours a day. Very addicting. Thinking about paying 99 cents to get past this level. great game but addicting if you have not played it TRY IT!! I found "aa oo" a better game. no glitches and very smooth. Although its new game i think but its gameplay was very polished.